"#3776 CENTURY" is the name of collection of technology and long history of PLATINUM. To begin with, "#3776 CENTURY" is born for writing Japanese beautiful but this feature - smart design, exquisite writing balance and smooth ink flow - is comfortable to write letters all of the world. 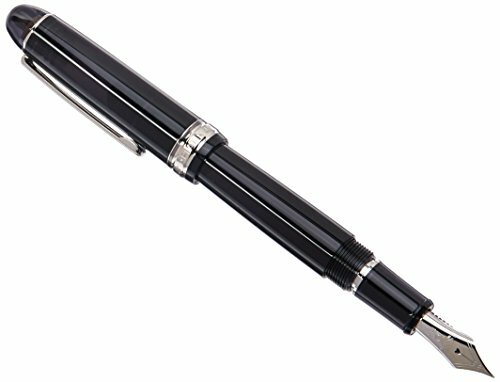 This fountain pen is made from tremendous amounts of information - collection of over 1,000 fountain pens. The crystal is "#3776 CENTURY". By the way, what mean "3776"? This is height of Mt.Fuji. So, the heart of "#3776" is to pursue the highest quality of Japanese fountain pen. Also, the desiｇn is traditional and chic. The nib is large 14K. It is said that 14K have moderate hardness and softness at same. but the most special feature is "Slip and Seal" mechanism. This pen adopt screw type cap. Screw type can protect "pumping phenomenon" (When you open the cap, the ink is scattered), but it hasn't been enough to seal. If you don't use more than 3 months, ink has dried out - ink is caked inside nib. If the damage is severe, it is needed to repair or replace the nib. But this mechanism is able to seal cap perfectly. If you don't use 1 year, you can write smoothly. This is the world first innovative mechanism. This pen is attached with converter (Of course, you can use cartridge ink). Music nib : Originally, this nib is for music. Vertical line is thick and horizontal line is thin. This design is proper to draw music note (Imagine the 8th note). But this distinctive design is very fascinated. It can used as Calligraphy pen. "Slip and Seal mechanism" - You write smoothly even if you don't use 1 year. Packaged in an elegant gift box with converter and 1 black ink cartridge.